An artful take on the classic playing card deck. Entirely original. Purely enjoyable. 52 cards. 2 Jokers. 1 unforgettable deck. 476 backers pledged $19,138 to help bring this project to life. Here ye! Here ye! To all you entrepreneurs in Kickstarter Land, the artists & designers, Peter Dunham and Linnea Gits, at the design studio, Uusi have created a card deck that celebrates the empire builder in all of us. 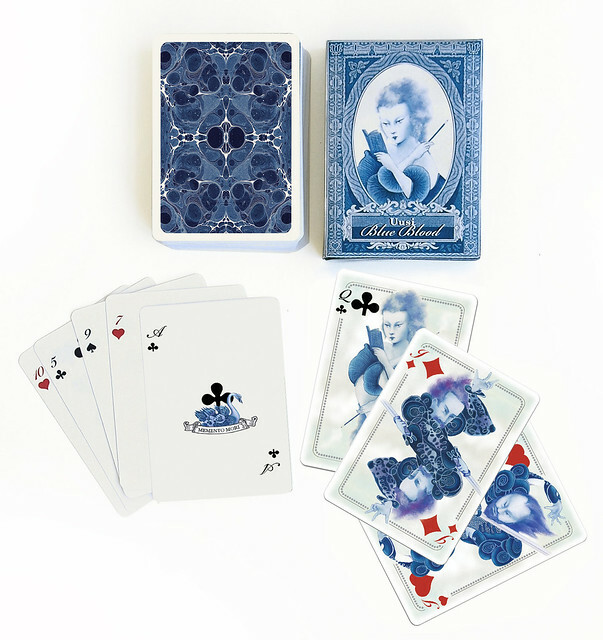 Inspired by the long and highly collectable tradition of limited edition artist's decks comes our Blue Blood Playing Cards - a 52 card poker deck. 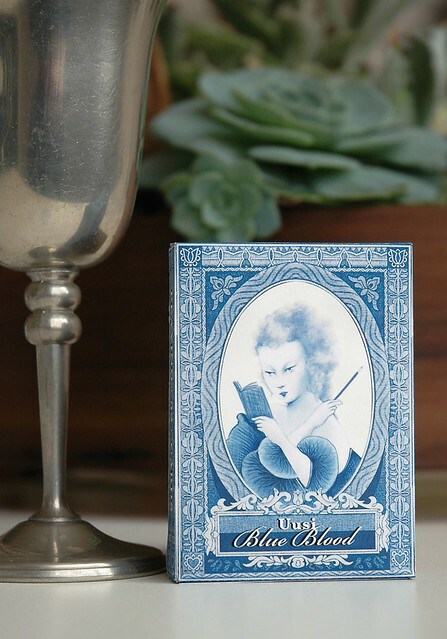 We hope you share our passion for collecting and playing with these cards and are asking you to help us become a part of this celebrated tradition by bringing our Blue Blood deck to life! Linnea and I have been collecting card decks as inspirational objects at our studio for years and finally decided the time had come to create a deck of our own. Using our Fine Art and Illustration backgrounds we decided the court cards for the deck would be a great place to start. We worked on the imagery in a unique back and forth process that produced the final illustrations, with Linnea working late at night, after her day at the studio, creating the characters and their faces, and my working early in the morning, before the start of my day, drawing their costumes. During this process the personality of the individual characters began to come to life. Every suit took on its own lineage and characteristics and we had fun making up stories of what kind of rulers they would be. Out of the mist and shadows of legend come the last of their line - The Blue Bloods! Each suit has its own unique rulers with characters as individual as the classic symbols they represent. The Diamonds. They come from a long line of rulers wise to the politics of the court and wealthy from shrewd business dealings with the trades. A symbol of energy, money and well being, the diamond suit is a powerful dynasty. Rulers such as this have a true assassin for their Jack. He guards their secrets and wealth with deadly skill. The Clubs. Trouble makers skilled in the art of deception - this is a dangerous monarchy. Their suit begets great difficulty and chaos. The Jack of Clubs is one-eyed and full of sneaky tricks. Their King is not above cheating and the Queen is a beauty capable of great manipulation. The Hearts. As passionate as their symbol declares, these are rulers of the people. Loyal, appreciative and fair they are capable of true devotion. The King is honest and peace-loving. His Queen is playful and flirtatious, but forever faithful - and their Jack will risk his own life to protect a kingdom he believes in. The Spades. The oldest and wisest of the suits. Revered, reclusive and quite a bit eccentric, the Spade is the symbol of philosophers and visionaries. Its Queen is a child-bride whose thoughts are tuned entirely to the beyond. Her King is a powerful, but shadowy royal from an exceptionally old family. Their Jack is a wild force to be reckoned with. Joker's Wild: It wouldn't be a Blue Blood Court without a Joker with a case of the moody blues! Depending on which way this guy is dealt you either get a happy or sad fool. BB Card Backs and Ace of Clubs. Memento Mori, is a Latin phrase that means, "Remember your mortality." It serves to remind rulers that they - like everyone else - are simply human. Nothing lasts forever. In the high stakes games of risk and chance - as in life - it is wise for all to remember their limitations. And no card better expresses this than the Ace. And on that note, let's talk about the money. It takes a long time to create original, hand-drawn artwork, but we are not asking you to pay for our design time - that's our passion - we enjoyed creating all the art for this deck, whether we are paid for it or not. But every artist needs a patron if they want to share their work beyond their doorstep - and that is where you come in! We need you to be our patron - become a part of the Blue Blood history! If funded, we will be printing our cards with one of the premier card deck producers in the country, The US Playing Card Company who has over 100 years of experience making classic decks. The deck will be produced with BICYCLE GRADE card stock with AIR CUSHION and magic finish. You can be assured that the card deck you receive will give you years of playing card fun and only get better with age. Using a printer like this however, requires a high minimum order - 2500 decks. Right now we stand at their door with our pockets pulled out. With your help, we hand them the sack of coins they're requesting. We also wanted to extend the Blue Blood line into some lovely incentives that you will be getting for way below their retail value. This is where we used our contacts to help us create a one-time only collection available to you should you choose to pledge. We want to thank you for looking at our project and hope you are inspired to help us bring it into the world! 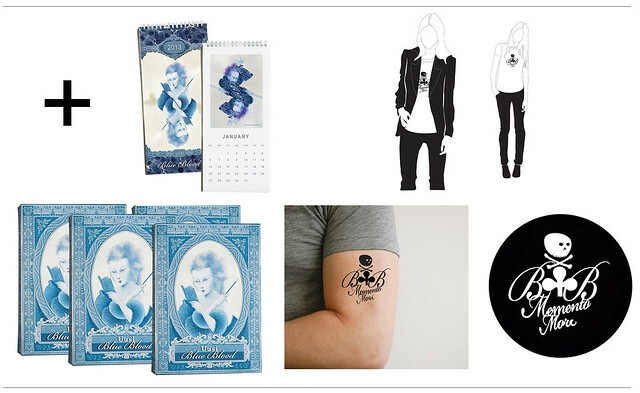 $55 + PLEDGE introduces the official, royal wall calendar for 2013 and includes 3 of the Blue Blood decks, our temporary, "Memento Mori" tattoo and embroidered patch. $85 + PLEDGE introduces our Limited Edition "Memento Mori" T-Shirt. Plus all the items shown above. 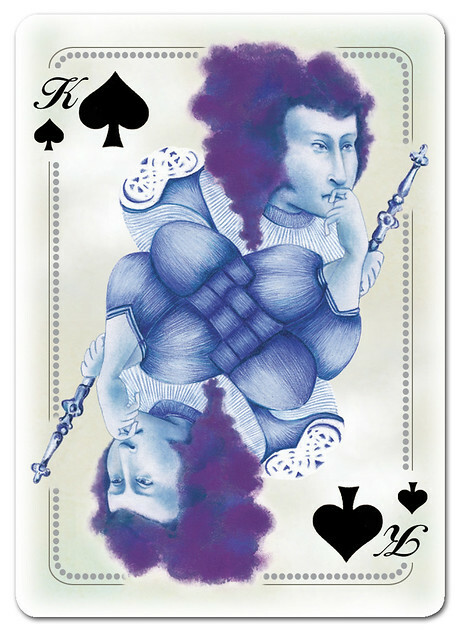 $120 Pledge Includes all the above plus our Limited Edition Blue Blood prints: The Queen of Clubs and The Jack of Spades. Printed on heavy, archival paper and lightly hand-colored. (Easels shown above not included). 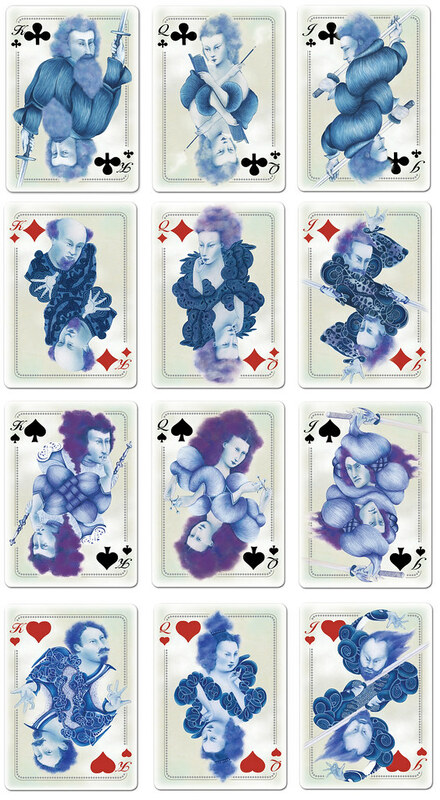 See more images of the Blue Blood deck & incentives right here. Special thanks to the band, Sandy Nelson and the Sin City Termites for letting us use their song, "Moody" in our movie! BLUE BLOOD ON YOUR MIND - A grateful and devastatingly pretty, thank-you-for-thinking-of-us email. 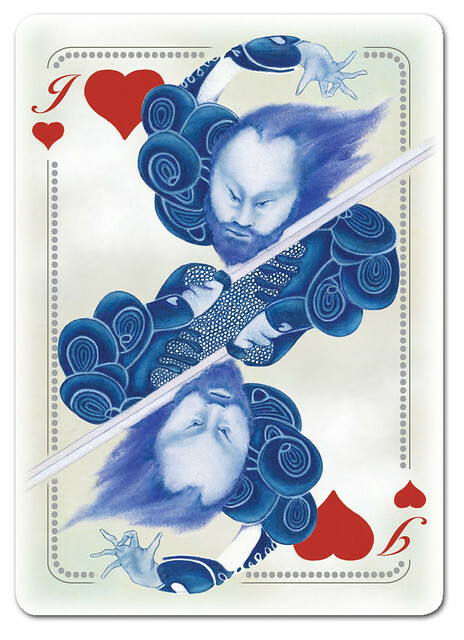 BLUE NOTE - This pledge gets you 1 Blue Blood deck of your own. (Add $10 for international shipping). BLUE AGAIN - A second chance to get 1 Blue Blood deck of your own. (Add $10 for international shipping). 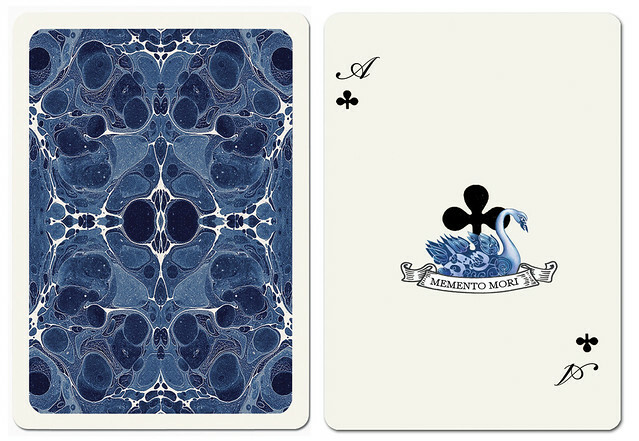 BLUED & TATTOOED - 1 Blue Blood Playing Card deck and a temporary tattoo of our Ace of Club's artwork, "Memento Mori". (Add $10 for international shipping). BLUE PLATE SPECIAL - 2 Blue Blood Playing Card decks and a temporary tattoo of the Ace of Club's artwork, "Memento Mori", plus a "Memento Mori" embroidered patch. (Add $10 for international shipping). BLUE DANUBE - One, two, three. One, two, three. Waltz away with 3 lovely BB decks. (Add $10 for international shipping). LAST BLUE WALTZ - 3 decks for the last dance. (Add $10 for international shipping). 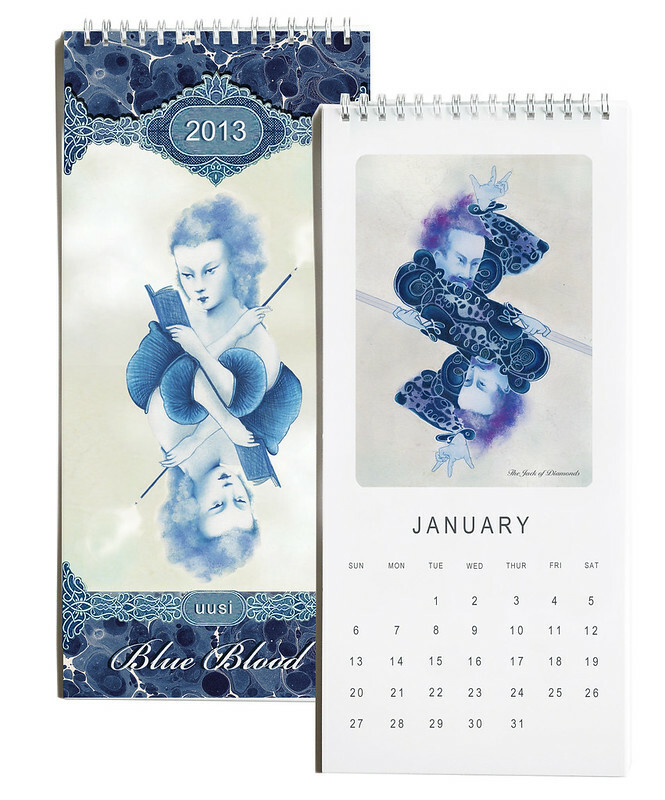 BLUE BLOOD FOR THE AGES - BB 2013 wall calendar featuring the original art for the 12 BB face cards - one for each month. 3 BB Playing Card Decks and our "Memento Mori" Temporary Tattoo & embroidered patch. (Add $15 for international shipping). BLUE IN THE FACE - 6 Blue Blood Playing card decks for the card collectors out there who don't want any of the fancy stuff - just the decks. This one is for you. (Add $10 for international shipping). BLUE COLLAR - Another no-frills option for the card collecting community: 6 Blue Blood Decks and one uncut press sheet from the run signed & numbered. (Add $25 for international shipping). TRUE BLUE - Introducing our Limited Edition, BB T-Shirt featuring the artwork from the Ace of Clubs "Memento Mori". Also included: our BB 2013 wall calendar, plus, our "Memento Mori" temporary tattoo and embroidered patch. AND 4 BB Playing Card decks. (Add $25 for international shipping). FLOW BLUE - 12 Blue Blood decks. (Add $25 for international shipping). BLUE FLAME - The hottest all-deck pledge: 12 decks and a signed & numbered uncut press sheet. (Add $30 for international shipping). 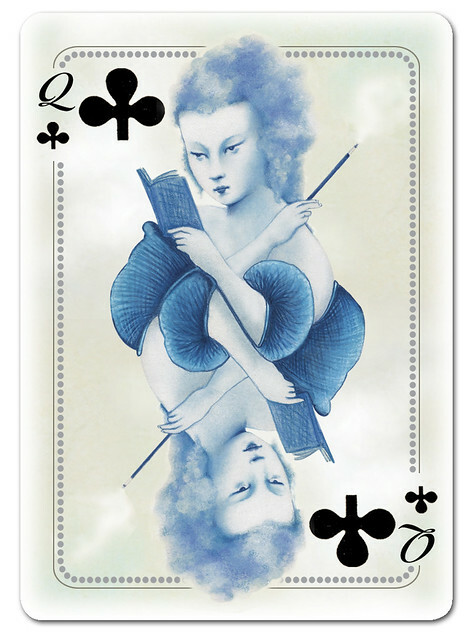 BLUE CHIP BLUE BLOOD - Introduces 2 of our Limited Edition Blue Blood prints - The Queen of Clubs & The Jack of Diamonds. Printed on archival paper and lightly hand-colored. Signed & numbered. 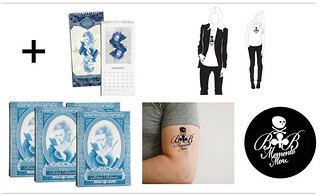 PLUS, our "Memento Mori" BB t-shirt, temporary tattoo & patch, the Blue Blood wall calendar and 6 Blue Blood decks. BLUE RIBBON - 24 winning decks. (Add $30 for international shipping). TOO BLUE - 24 decks and1 uncut, signed & numbered press sheet. (Add $35 for international shipping). BLUE SKIES - The sun shines on you with this 48 deck pledge. (Add $40 for international shipping). 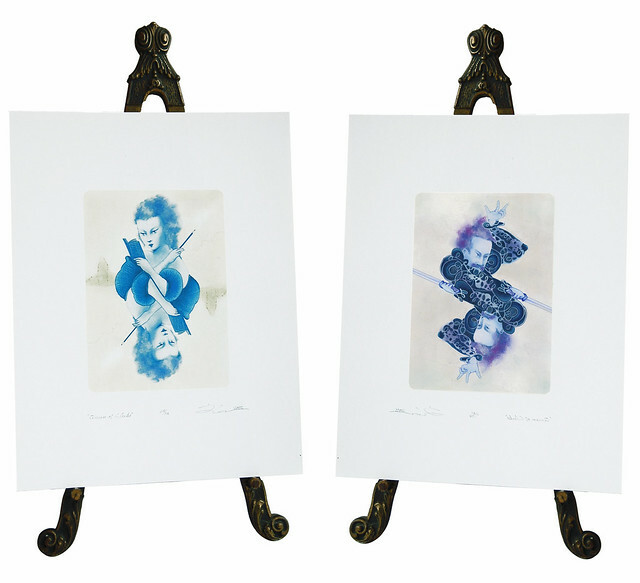 BLUE STREAK - All 12 of the court card Limited Edition, Blue Blood prints, signed & numbered. PLUS, your name on a special "Thank You" card included in the deck. AND, our Memento Mori BB t-shirt, temporary tattoo & patch. The Blue Blood wall calendar, 12 BB decks and 1 uncut press sheet, signed & numbered. CLEAR BLUE SEA - Sail away with 72 decks. (Add $60 for international shipping). DEEP BLUE - 144 decks for one treasure hunter. (Add $125 for international shipping).